Smith Mountain Lake is a 20,600 acre lake with 500 miles of shoreline offering sailing, water skiing and wake boarding, jet skiing, paddling, stand up paddling, and swimming. There are several public boat ramps and private marinas nestled among lots of lakefront real estate. The lake is a popular tourist attraction. Off-water you’ll enjoy sightseeing that includes many spectacular views of Smith Mountain Lake’s mountainous 500-mile shoreline. Five challenging golf courses surround the lake, and Smith Mountain Lake State Park includes miles of hiking trails. Fairy Stone State Park, the largest of Virginia’s six original state parks (4,741 acres), is home to its namesake “fairy stones.” These rare mineral crosses and the park’s scenic beauty, rich history, and ample recreational opportunities make it a local and regional favorite. More than 9 miles of multi-use trails and a 168-acre lake will keep you busy. The park is also just minutes from the Blue Ridge Parkway. Franklin County Recreation Park is a 150-acre park, located south of Rocky Mount (just 2 miles from Route 220). 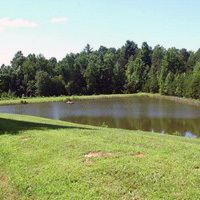 The park offers a variety of outdoor activities for all ages including, fishing in a 3-acre lake. It hosts various special events and athletic tournaments. Grassy Hill is a prominent landmark on the west side of Rocky Mount. 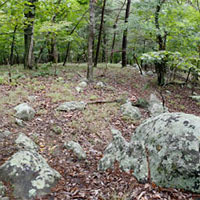 The site is characterized by rocky slopes forested with hardwood species and scattered patches of Virginia pine. Shallow, basic, heavy-clay soils predominate and outcrops of magnesium-rich bedrock are common. These unusual soil and rock substrates provide habitat for rare woodland communities. Several rare plants grow in small grassy openings near the hill’s summit. The trail includes 6.6 miles of hiking trails with signage. Parking for trail users is available adjacent to the preserve. Dogwood Glen Trail is a 5-mile hike with a scenic lake, wildlife, and wooded views. This trail stretches from Salthouse Branch Park at Philpott Lake to the Philpott Park Tailrace. There are some tough climbs and a few short downhill segments. Various stretches of the trail run along the shoreline of Philpott Lake. The approximately 7-foot wide trail can be accessed from Philpott Dam (Franklin County side) or Salthouse Branch Park. Parking is limited at Salthouse Branch Park ($4 day-use fee) and not accessible for equestrians at that location. 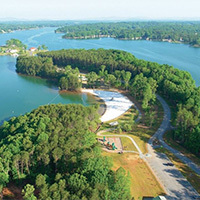 The 37-acre Smith Mountain Lake Community Park opened in June 2007. It is a family-oriented facility providing swimming, fishing, and family recreation. The park is open year-round and offers a partly-covered handicap accessible fishing pier with seating, picnic shelters with grill, playground area, restrooms, hiking, jogging, and a beach with lifeguards on duty when open. 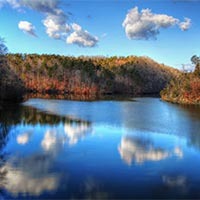 The park includes 3 miles of pleasant lake and wooded view hiking. Entry and exit points are scattered throughout the park. More than 400 acres of rolling terrain and creek crossings make this area great for beginners and more experienced hikers and bikers. The location also hosts various special events and athletic leagues.